Ginseng's genus name Panax is derived from the Greek, and means panacea or cure-all. In Asian medicine, dried ginseng is used as a tonic to revitalize and replenish vital energy, which is referred to as qi or chi. In traditional Chinese medicine Panax Ginseng is usually prescribed in combination with other herbs as “teapot” medicine. Ginseng is a tonic herb used for rejuvenate and invigorate. It is considered an adaptogen, providing non-specific protection against various mental, physical and environmental forms of stress. Panax ginseng is a slow-maturing perennial herb native to the mountain forests of northeastern China, Korea, and Russia. The plant is cultivated extensively in China, Japan, Korea, Russia, Canada and Wisconsin in the US. 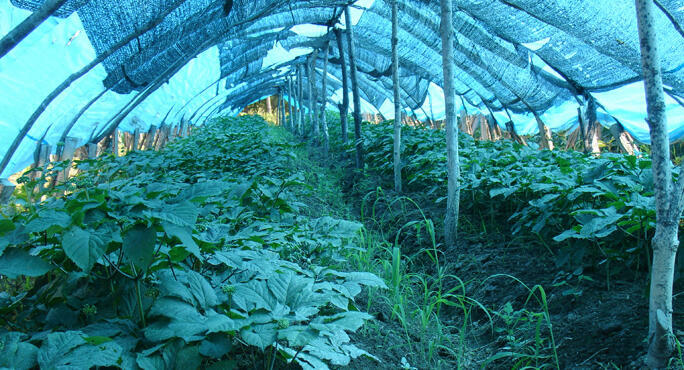 Ginseng usually starts flowering at its fourth year and the roots take four to six years to reach maturity. Panax ginseng is one of the most heavily cultivated and widely consumed herbs on earth. Ginseng root consists of the dried main root, lateral roots and root hairs or “tailings” of P. ginseng C.A. Meyer. According to Germany’s Commission E, ginseng root contains at least 1.5% ginsenosides, calculated as ginsenoside Rg1. Natural unprocessed ginseng root is white in appearance. So-called red ginseng root is prepared from white ginseng by various processing methods, such as steaming the fresh root before drying. Panax ginseng is sold in types and grades, depending on its geographic origin, root maturity, parts of the root used (main root or “tailings”), and methods of preparation or processing such as bleaching or processing into “red” root. Ginseng root contains various polysaccharides, saponins, sterols, polyalkenes and essential oil. The biologically active constituents in P. ginseng are triterpene saponins known collectively as ginsenosides. They are also referred to in some literature as “panaxosides.” At least 30 ginsenosides have been identified in Panax ginseng. Of these, ginsenosides Rg1 , Rc, Rd, Rb1 , Rb2 , and Rb0 are generally regarded as the most important. Ginsenoside values of ginseng root vary according to origin, plant maturity and other factors. 1. Bruneton, J. 1995. Pharmacognosy, Phytochemistry, Medicinal Plants. Paris: Lavoisier Publishing. 2. Leung, A.Y. and S. Foster. 1996. Encyclopedia of Common Natural Ingredients Used in Food, Drugs and Cosmetics, 2nd ed. New York: John Wiley & Sons, Inc.
3. Wichtl M, Bisset NG (eds.). Herbal Drugs and Phytopharmaceuticals. Trans from 2nd German ed., (Stuttgart: Medpharm GmbH Scientific Publishers. 1994). 5. Dr. Duke’s Phytochemical and Ethnobotanical databases http://www.ars-grin.gov/cgi-bin/duke/farmacy2.pl February 2, 2006. 6. Blumenthal M, Busse W, Goldberg A, Gruenwald J, Hall T, Riggins CW, Rister RS (eds.). The Complete German Commission E Monographs: Therapeutic Guide to Herbal Medicines. S. Klein, R.S. Rister (trans.). 1st ed., (Austin, TX: American Botanical Council. 1998). 7. Blumenthal M, Goldberg A, Brinckmann J (eds). Herbal Medicine: Expanded Commission E Monographs. 1st ed., (Newton, MA: Integrative Medicine Communications. 2000).